David Willson is the author of REMF Diary (1988) and The REMF Returns (1992). Working from his diaries composed in Vietnam, Willson tells the story of the war as it occurred for most soldiers. Willson has now turned his eye to his current battle with cancer and the Veteran’s Administration. His REMF Diary of Dying and Bureaucratic Complexity appeared as a Special Feature of WLA Online. The magazine writes that it will be updated with new installments the first of each month. Four chapters ending in 2009 had been posted here. My ribs had been causing me some serious pain since June. I’d been to see Dr. Brooks several times and lots of theories had been pursued but none had panned out. Finally, in October, I was sent to a specialist. He did a biopsy and had me do a 24 hour urine collection. Dr. Lee gave me the diagnosis. Multiple Myeloma. Okay. I thought I recognized the name of the disease from the Agent Orange Dirty Dozen list. Dr. Lee kept saying that she hoped that I had prostate cancer, and I didn’t get why she’d say that. She explained that prostate cancer could be cured, but that multiple myeloma had no cure and no remission. I got it then. When I got home I looked up the Agent Orange disease list on the VA website and there it was, nestled between Hodgkin’s disease and respiratory cancers (lungs, bronchus, larynx, trachea.) Fine bedfellows. The big heading on this section was “Presumptive conditions for disability compensations.” An open and shut case. I am a Vietnam veteran who served in-country from September 13, 1966 through October 23, 1967. I was stationed in Tan Son Nhut and then in Long Binh, but because I worked for the Inspector General, I was all over the country. I was presumed to be exposed. I was diagnosed with multiple myeloma by several doctors, including Dr. Norman, my oncologist. I was told that I had Stage 2 B, and that my disease was in an aggressive mode. Looks to me as though I have hit the jackpot. I sat right down and wrote the VA a letter apprising them of my situation. I included a copy of my DD 214, the one that my SS# is wrong on. Also I included a copy of a document from my doctor which showed that I had been diagnosed with multiple myeloma, with no remission. This should do it I thought. Here’s the short letter I sent them. Please let me know what the next step is in this process. I would also appreciate notification of receipt of this letter. Thanks. I got a letter back from the VA in a week or so. I was given a file number, but not a claim number. That’s a start, but I wondered about the difference between a file number and a claim number. Is a file number different from a claim number? Does that mean my status is lower? I didn’t know. The letter assured me they had received my application for benefits. They sincerely desired to decide my case promptly. They have a lot of claims, so I shouldn’t hold my breath. I am paraphrasing here. They will contact me if they need additional evidence or information. They tell me that they don’t want me to contact them. They will contact me. Well, that was food for thought. I was getting a sinking feeling. They tell me that if my mailing address is different from that shown above that I should contact them. Please advise them of my new address. Why would the address be different, I thought? I just gave them the address I’m going to live at until I die. I’ve been living at this address for 16 years. I looked at the address on the letter. It was wrong. So wrong that I couldn’t figure out how the letter got to me. They’d inverted the second and third numbers of the street address. Not good. My eyes danced to my name. My name was wrong, too. Oh, oh. I was beginning to think this process might not work as well as I’d hoped. How much faith can I place in an agency that gets my name and address wrong, when the information I provided them was correct? I suspected this agency didn’t care about me. I started to worry and fret. I talked to Vietnam veteran friends. They told me that I was doomed if I didn’t have a service rep helping me get into the VA system. As a long time member of the VVA, I decided that I needed to get the name of a VVA rep in the Seattle office. A dear old friend who works for the national office of the VVA referred me to Roosevelt Ward and I set up an appointment with Roosevelt Ward. “L’s” in Willson. My address is: 23630 201st Ave SE, Maple Valley WA 98038. Not “210”—Not. I have been diagnosed with multiple myeloma Stage II B, and my disease is aggressive. I cannot afford the cost of the thalidomide my doctor prescribed for me. That is not good. I will die sooner without it. I had to pay $4,000.00 last Friday for my prescription. The U.S. Dept. of Veterans Affairs Website tells me that multiple myeloma is on the list of Agent Orange presumptive disabilities. So, as I did 13 months in Vietnam, I want the VA to pay for my medicine. That seems reasonable to me. Also, please get my name and address right. I hoped that the VA would fix my name and address problem. I drove into Seattle and met with Roosevelt Ward in the VVA office on the tenth floor of the Henry Jackson Building. I spent a couple of hours with him as he patiently helped me through the forms for the VA. He gave me a serious orientation into what I had to deal with. Basically the VA had developed a series of hoops that are incredibly hard to jump through. I couldn’t answer many of the questions the VA asked. Not off the top of my head. I couldn’t answer the questions related to my marriages and divorces. Mr. Ward explained to me that my disability application wouldn’t go anywhere with the VA without copies of the documents related to my marriages and divorces. I went away from my meeting with Mr. Ward armed with the information I needed to do battle with the VA. I’d learned that the VA would not be easy to deal with. My wife, Michele, and I spent the next Friday morning in the Seattle courthouse and the records center. The marriage records were in one building and the divorce records were in another building. I guess they didn’t want the records commingling. We did battle with ancient microfilm readers and ancient microfilm and microfiche. The film and fiche were damaged and tattered, and the faint entries from the divorce decree ledger of 1971 were almost unreadable. Without the decree number, the clerk could not retrieve the certified copy of the decree that we needed. I had to use a large magnifying glass to read the retrieval number of the divorce decree. Around us were other sick old veterans, nearly crying tears of frustration as they tried to deal with the decrepit machines and the ruined microfilm. It was a struggle for me, too, and I had the advantage that I’d spent my thirty year career as a reference librarian working with old microfilm readers and with ancient microfilm. These old guys had never seen a microfilm reader or microfilm before today, and they weren’t doing well. They didn’t know which end was up on the microfiche. We got our retrieval number, gave it to the clerk, and received our copy of the decrees and paid and were on our way. The other sick old vets were still struggling. Good luck to them. I saw the clerk come out from behind his counter and go over to them. It looked as though they would get professional help. Good. Michele and I then drove down I-5 south to the Tacoma Group Health Building in rush hour traffic. We checked in with Dr. Norman’s office and completed the process of qualifying for the thalidomide. It’s part of the Thal-Dex treatment. We went down to the pharmacy and learned that the thalidomide cost $9600.00 of which we had to pay $4,000.00 out of our pockets, due to something called “the donut hole.” This was the first I heard that Medicare had anything called a donut hole. What is it? I’d have to look into that. But for now we chanced maxing out our Visa card to pay for the needed medication. I wanted to start taking the stuff right now as my life depended on it. We left Group Health feeling poor and bereft. Shouldn’t the VA be paying for this? Dr. Norman had informed us that some of his cancer patients did get their medication paid for by the VA. He didn’t know what process they went through to get the VA to pay for the medication. Neither did I, but I would try to find out. I knew it wouldn’t be easy. The book on Federal benefits for Veterans and Dependents says that I met the presumptive conditions for disability compensation. But when? In the fullness of time? When I got them every marriage and divorce document that they required? Time passed. I took the thalidomide and the steroids as prescribed. Michele and I drove to American Lake and I registered for a VA medical card and got put into the VA system for medical care. That involved filling out a three page form that required detailed information about our income last year when Michele was still working fulltime as a principal, well before she quit her job to spend more time with me. Now she’s working part time, just enough to pay for our medical coverage. Everyone I dealt with at the American Lake VA Hospital was kind and helpful. Michele and I watched the sick old vets (many of them Vietnam vets younger than I) stumble past us. Some of the veterans around us couldn’t even walk at all. The passing scene made me feel lucky. I looked good and felt good, except for the pain in my ribs, the pain in my back and the pain in my right leg. We waited about an hour while our paperwork was examined and entered into the system. Then we were called to Room B for our interview. We were informed of what was available for us and that I’d get my ID card in 7 to 10 days. We were informed that free valet parking would be available for us when we went to the VA Hospital in Seattle for the next step in this process, which would be the Agent Orange Registry. Then I was sent to Room A where my picture was taken for the ID card. When I got home I called the Agent Orange Registry Office at the Seattle VA Hospital and was given an appointment for 10:30 Monday morning. This was on Friday. Things were moving along a bit faster. Good. I felt that I was making progress. Saturday we got our mail. There was an 81/2 inch manila envelope from the Department of Veterans Affairs. I checked my name and address. Both were wrong, again. This is not an agency that will be easy to deal with. Why can’t they get my name and address right? How is their mail even reaching me with the address so wrong? They want service treatment records from the service department. Those records will help them determine how my claimed disabilities are connected to my military service. How? They have my name wrong, my address wrong, and they think my service treatment records will have something to do with my recently diagnosed multiple myeloma? They are incompetent or fools. I am in a world of hurt. They prefer original records to copies. How would I have originals? The Army keeps the originals. I was a stenographer in the U.S. Army. I know how Army records keeping works. Soldiers never get the originals. The Army keeps them. That’s how it works. Included in the envelope was VA form 21-526. Many pages of mind boggling questions, questions that I’d struggled to answer with Roosevelt Ward’s help in the VVA Office. I need to call him and see if he’s got enough information now to submit the forms to the VA to move this attempt on my part to get disability for my multiple myeloma, and my medication paid for. I will also ask him for advice on how to correct my name and address with the VA. Writing them a letter didn’t work out. Continue reading, REMF Diary of Dying and Bureaucratic Complexity Part One. Read all the chapters here. 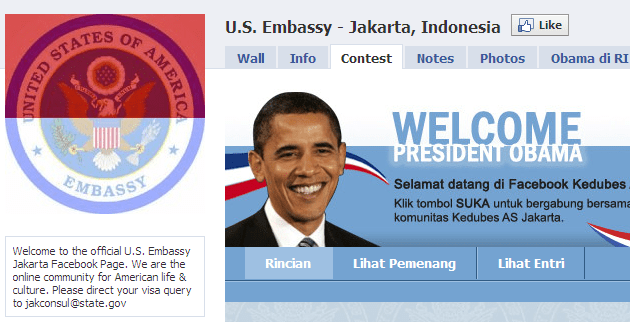 President Obama was only on the ground for 18 ½ hours but the day before his arrival, the US Embassy Jakarta Facebook page added 26,9918 fans. A day later, as he jet to his next stop, the official page has gained another 65,485 fans. 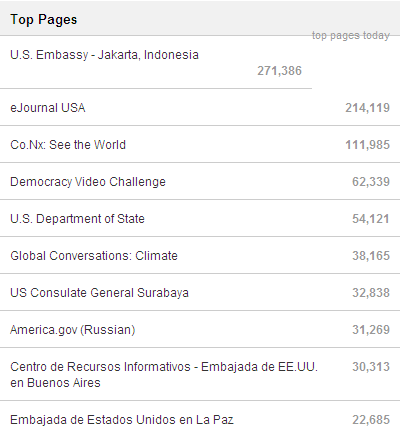 The dashboard has now been updated and at 272,983 fans, the US Embassy Jakarta Facebook page is officially the top dog among the top pages of the State Department!